All come with male threads on one end and female threads on the other. These rods are a light-duty, more flexible, brown .370" diameter fiberglass rod. 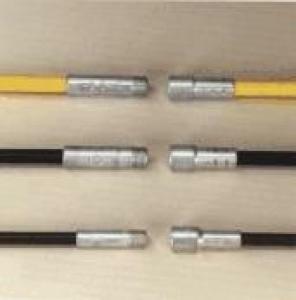 This rod is very popular because of its high degree of flexibility though it won't stand prolonged, heavy-duty use. These 3670 rods feature 1/4" pipe threads. To attach chimney cleaning brushes you'll need a 1/4"x3/8" adaptor.